Maxime Bernier, a runner-up in the 2017 Conservative leadership race, has filed final paper work with Elections Canada to register the People's Party of Canada, allowing it to provide tax receipts to donors and potentially run candidates in byelections. 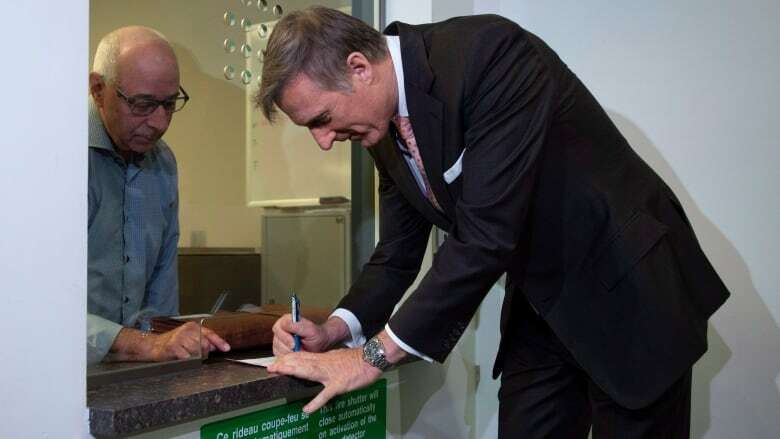 Maxime Bernier filed the final paper work with Elections Canada Wednesday to officially register the People's Party of Canada, allowing it to provide tax receipts to donors and potentially run candidates in upcoming byelections. The Quebec MP — who was the runner-up in the Conservative leadership race in 2017 but left the party in August after calling it "morally and intellectually corrupt" — announced last month that he would be forming his new party. The PPC advocates smaller government, the end of the country's supply management system, and a reduction in immigration to Canada, among other things. "It's a great day. It's a big day for us," Bernier told reporters at the offices of Elections Canada. "It's another step toward the formation and the accreditation of our new party." Bernier deposited the signatures of about 500 party members with Elections Canada on Wednesday, more than the 250 required. Once Elections Canada deems that the PPC is eligible for registration, the party will complete the process when it endorses a candidate for a byelection or a general election. Bernier says that the party's first official candidate will be himself. According to Bernier, the PPC has 22,477 members and has held founding meetings for 43 electoral district associations across the country, with another 27 to be held in the next week. That still leaves some work ahead for it to form associations in all of Canada's 338 ridings, but Bernier said the PPC is on track to meet its goal of having associations in every riding by the end of December. Bernier also says that he raised $350,000 since his departure from the Conservatives and believes the party can raise more than $3.5 million per year. But as Bernier had not yet registered the PPC, those donations were not eligible for a tax receipt. Maximum donations of $1,575 are eligible for a tax credit of $650. The party hasn't yet had any significant impact in the polls. The only survey — conducted by the Innovative Research Group — to include the People's Party in a voting intentions question, without any special prompting for it, found support for the PPC at just three per cent. But after depositing his paper work on Wednesday, Bernier cited the surprising breakthroughs of the People's Alliance of New Brunswick and the Coalition Avenir Québec in recent provincial elections, though he didn't say that he was necessarily aligned with either of their political views — in particular the People's Alliance opposition to linguistic duality in New Brunswick. He also said that he did not believe any other Conservative MPs would be joining his party. Nor was he trying to induce them to cross the floor. A spokesperson for the PPC says that the plan is to run candidates in the byelections that will have to be held in the coming months to fill the four vacancies in the House of Commons, if Elections Canada approves the party in time. But the PPC will miss the byelection in Leeds–Grenville–Thousand Islands and Rideau Lakes, which needs to be called by Oct. 30 to fill the vacancy left by the death of Conservative MP Gord Brown in the spring. A new party cannot run in a byelection called within 60 days of it applying for registration. That means the PPC could also miss the pending byelections in Burnaby South, York–Simcoe and Outremont if the writs are issued before mid-December.